<b>DIG IN:</b> The Historic Landmarks Commission was uncharac­teristically effusive about new plans for the Entrada hotel project slated for the bottom of State Street. Shown here is a rendering of the project’s public plaza. 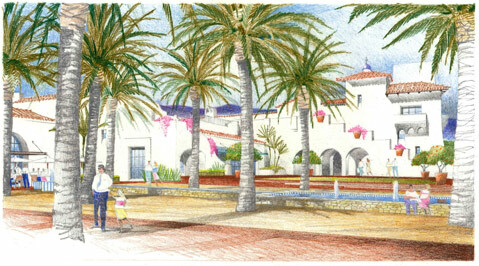 Twelve years after winning approval from the Santa Barbara City Council ​— ​and 16 years after development plans were first submitted ​— ​Santa Barbara’s notoriously protective and persnickety Historic Landmarks Commission (HLC) unanimously approved plans to build a new 123-room hotel on three parcels of downtown real estate that spread out from the epicenter of State and Mason streets down by the railroad depot. Conspicuously absent from this historic occasion was the developer himself, ​Michael Rosenfeld of Los Angeles; his attorney, Doug Fell; ​or any celebratory champagne corks let loose by any participants exhausted by the sheer length of time elapsed. Equally striking was the glowing praise showered upon the latest iteration of the project by members of the HLC, long famous among practicing architects for their glowering ​— ​sometimes caustic ​— ​criticisms. The extraordinary length of time required for Rosenfeld to secure such approvals can’t be blamed on the city’s often-maligned design review process. Rosenfeld, a recent arrival on the scene, only bought the long-troubled project a few years ago from Mountain Funding, the investment bank that foreclosed on the project’s original developer, Bill Levy, who had famously declared bankruptcy in 2007 after allegedly sinking $90 million into what he had hoped would be an “urban village” of time-share condos. Rosenfeld, now involved in a $2 billion renovation of the Century Plaza Hotel, managed to pick up the property for a mere $7 million at the height of the recession. Mountain Funding had rejected an earlier offer of $20 million as insufficient. Rosenfeld wasted little time reimagining a new configuration for La Entrada. Rather than building the 62 time-share condos initially approved, he would build a 123-room hotel. Rather than distribute parking throughout all three parcels, Rosenfeld proposed putting all the parking in one lot that would rise three stories aboveground on the parcel distinguished by the green wooden fence that surrounds the unfinished construction pit it encloses. That parcel will also be the site of a sweeping outdoor plaza, some quasi-public park space, and about 20,000 square feet of one-story retail shops that face directly onto State Street. A new high-end restaurant and/or wine bar will go up near Mason and Helena streets, in keeping with the new personality of the so-called Funk Zone it abuts. Likewise, Rosenfeld proposed compressing the construction schedule that had been imposed by city administrators in the vain hope that construction would proceed in a timely fashion. All this required City Administrator Jim Armstrong to issue what’s known as a “Determination of Substantial Conformance,” meaning that the proposed changes were still in keeping with what the City Council had approved in 2001. It’s worth noting that since 2001, the project has been issued no fewer than six such determinations, half of which involved relatively major changes. When Rosenfeld proposed the latest changes earlier this year, he received a very mixed response from the Historic Landmarks Commission. One member dismissed the new plans as “boring,” and others expressed alarm that Rosenfeld was attempting to shortchange the amount of open plaza space that previous developers had promised. Rosenfeld clearly heeded what he heard as did his architects with DesignArc. The previous plan’s most caustic critics on the HLC heaped nothing but superlatives upon them last week. Likewise, Rosenfeld took pains to mend fences with neighboring business and property owners ​— ​like Tony Romasanta ​— ​who’ve long had their noses seriously out of joint by the neglect and disrepair prior Entrada owners visited upon the street. “He’s done what he said he would do,” said Romasanta, normally outspokenly critical. “I’m optimistic.” When City Administrator Armstrong issued the last finding of substantial conformance, he decreed that construction would be completed no later than September 30, 2016, and that Rosenfeld would meet quarterly with city officials to ensure his pockets were deep enough to get the job done. While Armstrong, like Romasanta, had nothing but praise for Rosenfeld, his optimism remains tempered by the project’s long history of even longer delays. “I’ll believe it when they take out building permits and begin construction,” he said.